From left are Prof. Sebyung Kang (School of Life Sciences), Hyojin moon, and Bongseo Choi. Persuading the body's immune system to detect and destroy cancer cells. Immunotherapy has been seen as one of the greatest advances in cancer treatment, as it stimulates the body’s own immune system to detect and destroy cancer cells, while leaving healthy cells unscathed. 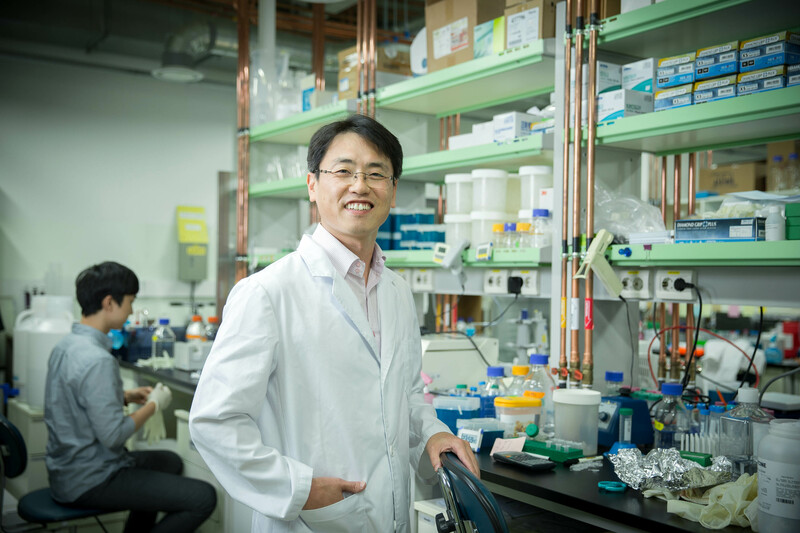 A new study, led by Prof. Sebyung Kang (School of Life Sciences) at UNIST has made a significant leap towards developing nanocarrier-based vaccine delievery systems that are capable of delivering antigens to immune cells. One of the most effective ways of mediating an antitumor immune response is through the generation of cytotoxic T cells. These potent immune cells directly kill their target cells in addition to secreting cytokines such as interferon-γ, which aid in tumor rejection. Because the tumor microenvironment actively suppresses the differentiation of cytotoxic T cells, immunotherapy is required to provoke an adequate anticancer response. In the study, Prof. Kang and his research team demonstrated the ability of dendritic cell therapy to induce cytotoxic T cell–mediated killing of melanoma cells in mice. In previous studies, the team has engineered protein cage nanoparticles made of the bacterial protein, encapsulin. The resultant encapsulin nanocompartments were 30 nm in diameter, which is an ideal size for navigating the lymphatic system. Furthermore, they were capable of carrying diverse cargos, including the antigenic peptide, OT-1, used in these experiments. 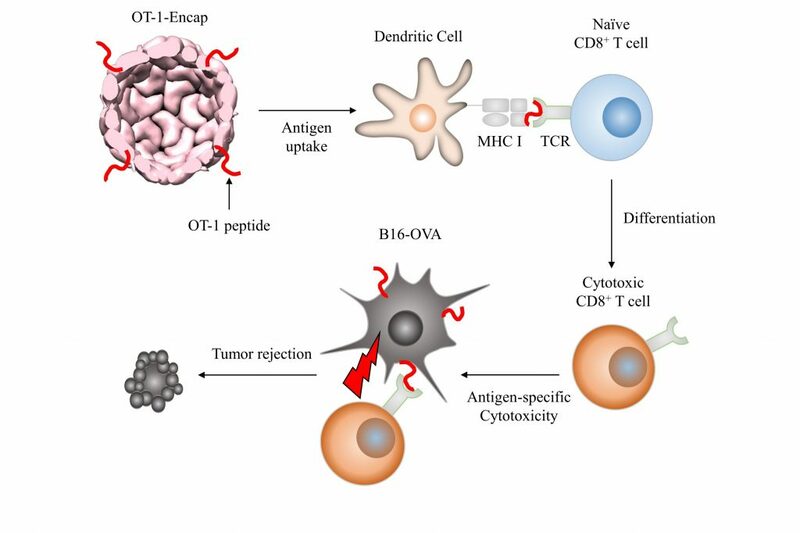 The schematic representation of OT-1-specific cytotoxic T cell differentiation and tumor rejection induced by OT-1-Encap-mediated prophylactic vaccinations. This research was jointly conduced by Prof. Yoon Seok Jung (School of Energy and Chemical Engineering), late Prof. YoonKyung Do (School of Life Sciences) of UNIST, and Prof. SungHo Ryu of Soonchunhyang Institute of Medi-bio Science (SIMS). The findings have been published in the July issue of ACS Nano. The team devised a model system where OT-1, an 8-amino acid residue of the protein ovalbumin was used in conjunction with a melanoma cell line genetically engineered to express ovalbumin to provide further evidence. 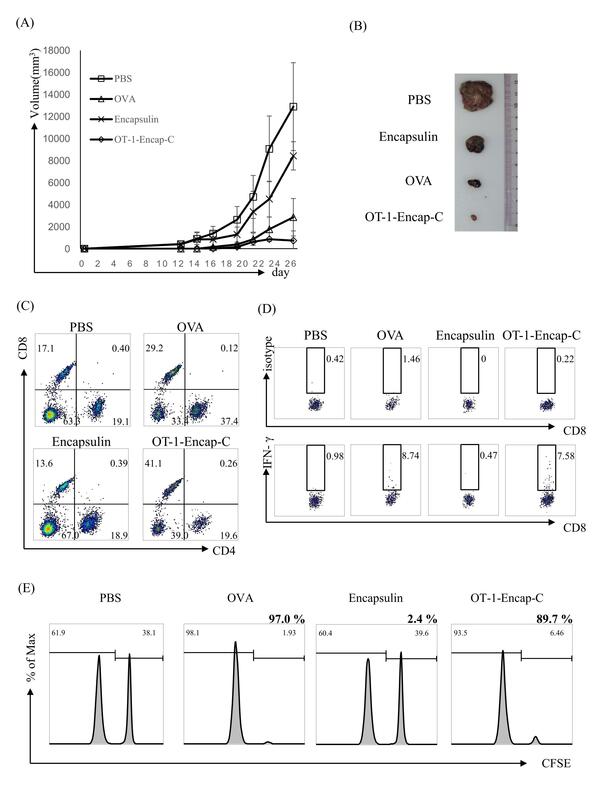 In mouse experiments, encapsulin cage nanoparticles delivered OT-1 to dendritic cells, which subsequently presented the antigen to naïve T cells. Treatment induced OT-1 specific T cell differentiation into cytotoxic T cells in the spleen and increased interferon-γ production. Subcutaneous melanoma tumor growth was markedly hindered when immunotherapy was used prophylactically. Results were more modest when the vaccination was administered 10 days after tumor inoculation, although the authors speculate that a booster injection would improve outcomes. 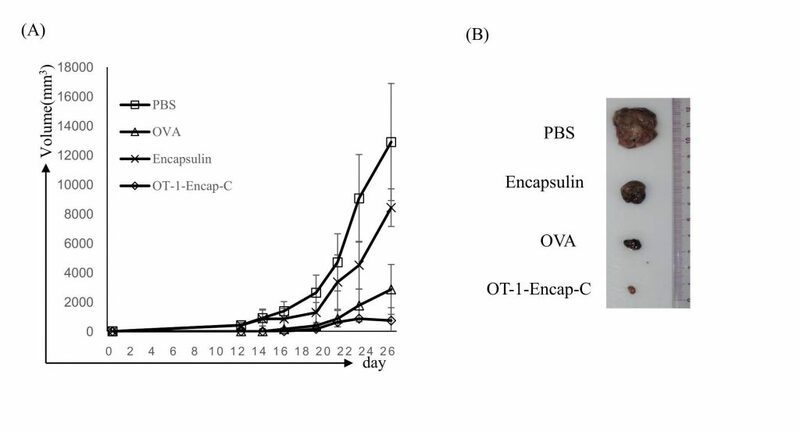 The figure shows prophylactic vaccination with OT-1-Encap-C suppressed B16-OVA tumor growth. Mice were sacrificed at day 26 after tumor challenges, and tumor masses were isolated as presented. 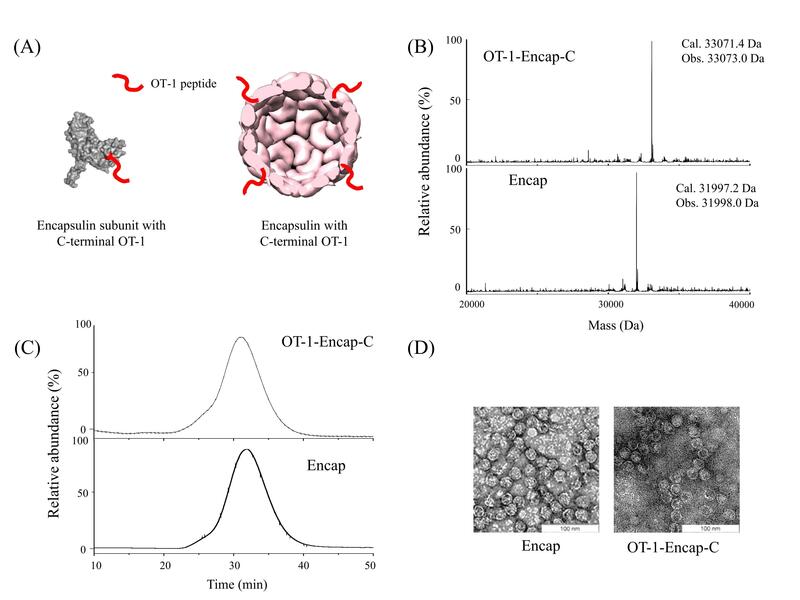 This study underscores the potential of encapsulin cage nanoparticles in enabling the dendritic cell–mediated activation of cytotoxic T cells for cancer cell killing. Utility is anticipated to be highest when used at early stages of tumor generation, when it is easiest for T cells to infiltrate the tumor. Future work is needed to extend results in this model ovalbumin system to a human tumor model and to evaluate the utility and timing of booster administration. Ultimate translation will depend on the identification of antigenic peptide sequences specific to the type of cancer being treated. According to the research team, the approaches they describe herein may provide opportunities to develop epitope-dependent vaccination systems that stimulate and/or modulate efficient and epitope-specific cytotoxic T cell immune responses in nonpathogenic diseases. Choi B, Moon H, Hong SJ, Shin C, Do Y, Ryu S, and Kang S. “Effective Delivery of Antigen-Encapsulin Nanoparticle Fusions to Dendritic Cells Leads to Antigen-Specific Cytotoxic T Cell Activation and Tumor Rejection.” ACS Nano, 2016.